Since I want to go faster while doing autox and eventually get into track days, I am looking at putting racing seats in my Miata. I came across a local guy selling a set of Bride Low Max Replicas so I am going to check them out tomorrow. 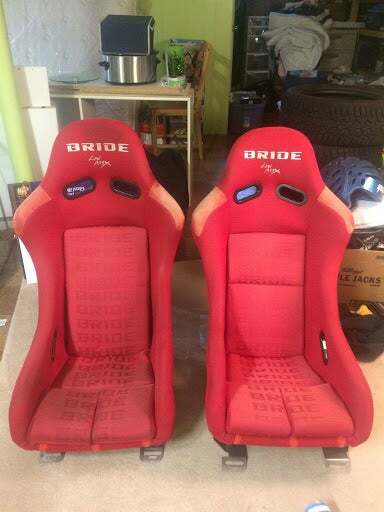 Hopefully if I like how they feel and they fit well in the car, I will have some bright red seats that grip me well! Included are garage star side mounts so I can hopefully get low enough to clear a roll bar. The beautiful part is just how easy it is to drop in the seats. 4 bolts and out goes the old and in goes the “new”. Hoping to sort out using the OEM 3 point seat belt but my eventual plan is to run a 5 or 6 point harness. I confirmed the seats do have sub slots so I can mount harnessess properly. As my car sits now, my head sticks out quite a bit. Sure a foamectomy could work but my seats dont have nearly enough bolstering anyways. So this should definitely do the trick!